Visiting Rotarians and guests are asked to note that the regular scheduled lunch time meeting of 12:30 p.m. for Wednesday 13 March 2019 is now a 6:30 p.m. dinner meeting at the Accra Beach Hotel to celebrate Vocational Services Awards 2019. Dress - Men, Jackets; Women - Elegant. Cost of dinner BDS$60.00 pp. Visiting Rotarians are asked to note that there will be no meeting of the Rotary Club of Barbados South on Wednesday 20 February 2019 at Accra Beach Hotel. Rotarians in Barbados will meet for a joint meeting on Thursday 21 February 2019 at 6:30 p.m. at the Hilton Hotel where there will be an address by the Cricket West Indies (CWI) Chairman, Dave Cameron. All are welcomed. The Rotary Club of Barbados South weekly meeting for Wednesday 23 January 2019 will be a Breakfast Meeting starting promptly at 7:30 a.m. at the Accra Beach Hotel and Spa, Rockley, Christ Church. We extend a warm welcome to visiting Rotarians on the island to attend the West Indies versus England Test Match. Come enjoy the hospitality and fellowship of Rotary in Barbados. The Rotary Club of Barbados South which was Chartered on the 13 January 1986 celebrated its 33rd Anniversary by hosting a Beach Barbeque along with its sponsored Rotaract Club who were also celebrating their Charter Anniversary as well. The event was held at the Silver Sands Beach in Christ Church Barbados and attended by members, Rotaractors, family and friends. It was a great day of fellowship for the club as it reaches this milestone. President Vivian-Anne Gittens was very pleased with the turn out and support for this club activity which is one of the signature events on the club's calendar. See pictures next page of the grand time had by all. On Wednesday 9 January 2019, District Governor Dominique Venere visited and met with the Board of the Rotary Club of Barbados South. This was part of DG Dominique's visit to Barbados from 7 January 2019 to Thursday 10 January2019 where she was hosted by the 3 clubs in Barbados at a gala cocktail reception on Tuesday 8 January 2019 at the Radisson Hotel. After meeting with the RCBS Board for its annual district review, she journeyed to the St. Philip District Hospital where the club made a presentation to the Hospital. The Board of RCBS wish to thank DG Dominique who was accompanied by Assistant Governor (Barbados) Lisa Cummins for her visit and advice on how we can engage our membership and continue to have a strong club. 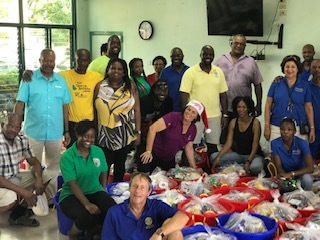 The Rotary Club of Barbados South twined its annual Christmas hamper project with the Rotary Cub of Portsmouth Dominica by donating 45 food hampers to deserving residents.These hampers were paid for out of the proceeds of a Dominica Appeal Fundraising dinner held by RCBS in association with Accra Beach Hotel that raised BDS$ 54,000. 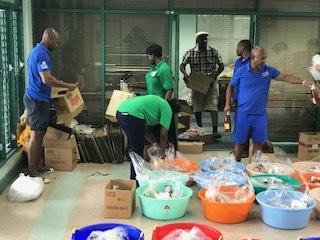 The Rotary Club of Barbados South held its annual Christmas Hamper distribution project on Saturday 15 December 2018. 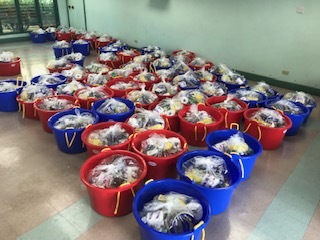 This year we distributed 240 hampers to families and homes across the island. Thanks to the generosity of our friends in the international business community domiciled here in Barbados, we are able to fund this project every year. 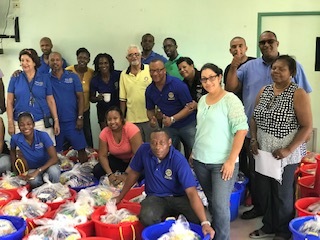 This year we had the support of our club members, their partners, children, and friends ad well as members of the Rotary South Barbados Rotaract Club. Thanks to all those who help pack the hampers and then deliver them to each and every deserving recipient. Thanks also to Guardian General Insurance Ltd. who allows us to use their sports club on an annual basis. We look forward to making this project even bigger next time around. 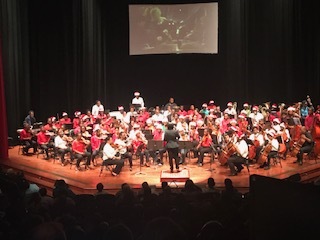 Sunday December 9 2019 saw another successful edition of the Rotary Club of Barbados South Classical Best of Youth VII Concert at the Frank Collymore Hall showcasing the Barbados National Youth Symphony Orchestra under the direction of Ms. Joy Knight. GCM. 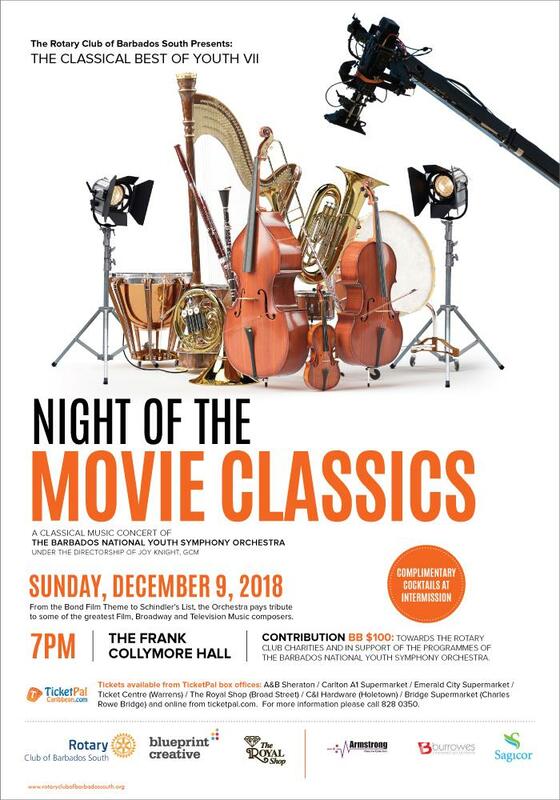 A grand time was had by all as the orchestra took the large audience back in time through their rendition of movie classics. 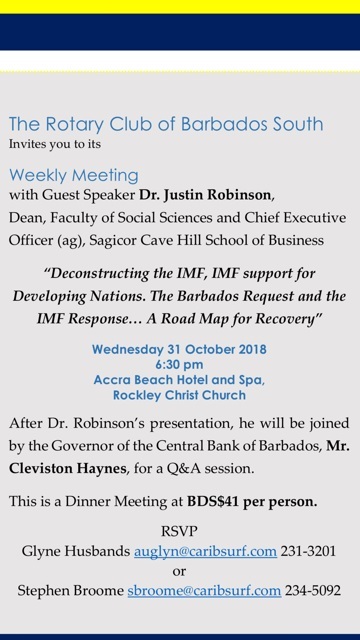 On Wednesday 31 October 2018, the Rotary Club of Barbados South will have as its Guest Speaker Dr. Justin Robinson, Dean, Faculty of Social Sciences, UWI Cave Hill Campus and CEO (ag) Sagicor Cave Hill School of Business to speak on the topic 'Deconstructing the IMF, IMF support for Developing Nations. The Barbados Request and the IMF Response... A Road Map for Recovery'. After Dr. Robinson's presentation, he will be joined by the Governor of the Central Bank of Barbados, Mr. Cleviston Haynes, for a Q&A session. This is a Dinner Meeting, please read flyer and RSVP as required. Nearly fifty (50) Rotarians and their partners-in-service from the three (3) Rotary Clubs in Barbados attended the recently concluded Rotary International Conference held in Toronto, Canada 23 - 27 June 2018. The conference had many highlights including an address on literacy by former First Lady Laura Bush, an address by Canadian Premier Justin Trudeau, HRH Princess Anne, and the election of the first Rotary International President from the Caribbean, RI President Barry Rassin from Rotary Club of East Nassau, District 7020. 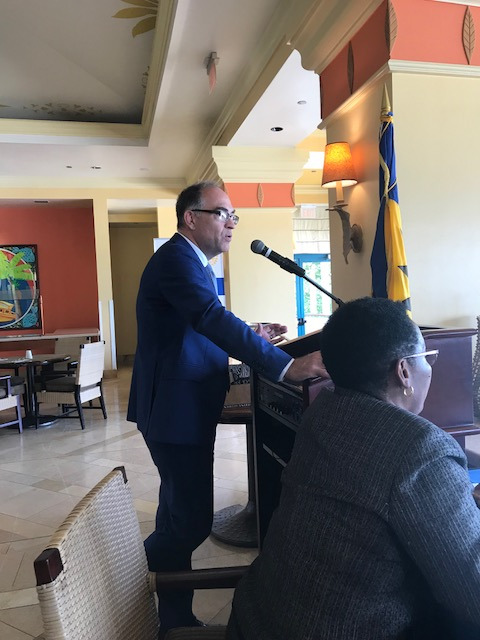 The three Rotary Clubs in Barbados honored outgoing UN Resident Coordinator in Barbados Ambassador Stephen O'Malley for his contribution to the Rotary Model United Nations Program for students and youth in Barbados at the Barbados Club weekly luncheon meeting held on Thursday 26 July 2018 at the Hilton Hotel. He was presented with a plaque by Past District Governor David Edwards along with representatives from all three clubs, Rotary Barbados, Rotary South and Rotary West. Increases Rotary's involvement with Youth Services in addition to RYLA, Interact, and Rotaract. The RotaryClub of Barbados South held its 33rd annual installation ceremony of Officers of the new Board on Friday 6th July 2018 at the Accra Beach Hotel and Spa. At left President Vivian-Anne Gittens being installed by PDG David Edwards, looking on is Immediate Past President Hiranand Thani. Below is the Board of Directors for 2018-2019 present for the installation. Visitors to our website are invited to join us on ou facebook page for photos and videos of our club activities. persons living with varying disabilities. The building has been designed to include a sensory room with light and sound stimulation, a soft‐padded room, a half‐sized basketball court, and a number of other activity areas. It will also include a playground which will facilitate activities by both disabled and able‐bodied children. The project is the brainchild of the Rotary Club of Barbados South, an organisation which over the years has spearheaded a number of community projects which have benefitted Barbadian society. Commenting on Scotiabank’s contribution to the project, President of the Rotary Club of Barbados South, Katrina Sam noted that the $75,000 cash donation will catapult the project towards achieving the goal of providing Barbados’ disabled community with a truly Inclusive Play facility. Scotiabank’s Angela Phillips (Manager, Finance) and Antony Philips (Senior Manager, Marketing), both of whom are Directors of Scotiabank (Barbados) Foundation Inc. have expressed their full support of the project. Kevin Teslyk, President of Scotiabank (Barbados) President: Katrina Sam-Prescod Secretary: Sonya Alleyne Email: rotarybarbadossouth@gmail.com Website: www.rotaryclubofbarbadossouth.org. Foundation Inc, said, "We saw it as imperative that we support the Inclusive Play project. First,it allows us to continue to contribute as we have over the years through our Scotiabank Bright Future Programme. At the same time, it enables us to deepen our relationship with the community." He added: "What impressed us particularly about this initiative was the degree to which it will encourage full integration between able‐bodied children and those with disabilities. We expect the project to go a long way towards stemming ignorance about and discrimination against persons with disabilities." Honourary Rotarian, has graciously accepted an invitation to be patron of the Inclusive Play project. The Rotary Club of Barbados South thanks the public for their support and notes that other fund‐raising activities will soon be announced. The public can receive regular updates on the project by joining the Inclusive Play Facebook page at www.facebook.com/inclusiveplay. (L‐R): Angela Phillips (Manager, Finance, Scotiabank); Antony Philips (Senior Manager, Marketing, Scotiabank); Professor Sir Hilary Beckles (Pro‐Vice Chancellor and Principal, University of the West Indies, Cave Hill), Katrina Sam (President, The Rotary Club of Barbados South), Rotarian Peter Thompson (Architect for the Project) and Rotarian Gordon Julian. The Rotary of Barbados South is embarking on an ambitious community service project aimed at “Inclusive Play”. An initiative of the Rotary Club of Barbados South ensuring that infants and children who desire to “play” can do so regardless of physical or cognitive ability. Our goal is to create an “Inclusive Play” facility where hildren of all abilities will play, learn explore, discover and imagine together in an environment where their common experiences make a more lasting impression than their different abilities. The proposed site of this universally accessible playground and recreational centre is the Sir Garfield Sobers Gymnasium. We have requested 25,000 sq ft. of land from the government of Barbados on which to erect this facility and we are working with all parties to secure the selected site. Barbados needs your help to make this exciting, socially responsible project a reality. Check out our facebook page by clicking the link on your left 'Useful Links'... hope you enjoy... leave us a message.